This post is sponsored by McCain Potatoes but the content and opinions expressed here are my own. Score a touchdown with your game day crowd with these Loaded BBQ Pulled Pork Beer Battered Fries topped with cheddar, pulled pork, green onions, and coleslaw! This dish a definite win for fans of football food! Here’s the deal – I might not be able to talk football, but I can definitely talk football food! You’ve got to have some great finger food during the big game whether it’s sandwiches or a spread of frozen appetizers and snacks! There’s nothing easier than pulling out your slow cooker the morning of the big game, cooking up some hot sandwich fillings, and then baking up frozen snacks for your crowd. One of the easiest hot sandwiches you’ll ever make in your slow cooker is pulled pork. Serve them with a side of fries and boom – dinner’s done! So I decided to take inspiration from one of the ultimate tailgating sandwiches and make some seriously loaded fries! I mean, what’s better during game day than a pulled pork sandwich, a side of crispy fries, and a cold beer? Putting it all together in one dish! These Loaded BBQ Pulled Pork Beer Battered Fries start with crispy McCain Craft Beer Battered Thin Cut Fries from Walmart. Bake them in the oven or start them in the air fryer, like I did, for extra crispiness. Then, load them up with shredded cheddar cheese, BBQ pulled pork, green onions, and a hefty spoonful of coleslaw! My tip to you is to make the pulled pork the night before. We had pulled pork sandwiches for dinner and then I used the leftovers to make these loaded fries the next day! So easy! You could also swap McCain Craft Beer Battered Thin Cut Fries for McCain Seasoned Curly Fries or McCain Extra Crispy Crinkle Fries. Place the boneless pork loin in the slow cooker. Add the garlic powder to the pork loin and season with salt and pepper. Pour the beer, barbecue sauce, and Worcestershire sauce over the pork loin. Add a splash of Tabasco sauce, if desired. Stir well to combine. Set the slow cooker on low for 8 hours. During the last hour, shred the pork with a fork and continue cooking. While the pulled pork finishes, cook the McCain Craft Beer Battered Thin Cut Fries according to package (I cooked them at 400º for 12-15 minutes in my air fryer). Add the fries to a large cast iron skillet. Top with shredded cheddar and pulled pork. Place the skillet back into the 450º oven for a few minutes, just until the cheese melts. Top with coleslaw and serve with extra barbecue sauce, if desired. The ultimate game day dish! You could make the pulled pork with pork shoulder, but I always use pork loin. It’s a little more tender and I still get the same delicious results! I also recommend saving some of the barbecue sauce you made for the pulled pork to dip the fries into! It came out really good! If this isn’t ultimate game day food, than I don’t know what is! Grab a fork (or just use your fingers) and dive into these Loaded BBQ Pulled Pork Beer Battered Fries! It’s definitely a snacking win! Grab everything you need to make this game day dish at Walmart. You can find McCain Craft Beer Battered Thin Cut Fries, McCain Seasoned Curly Fries, and McCain Extra Crispy Crinkle Fries in the freezer section. We love how McCain Craft Beer Battered Thin Cut Fries stay crispy, even loaded up with pulled pork and toppings! They’re made with American pale ale, giving them an amazing flavor that’s perfect football food! What’s your favorite ultimate loaded fries recipe? 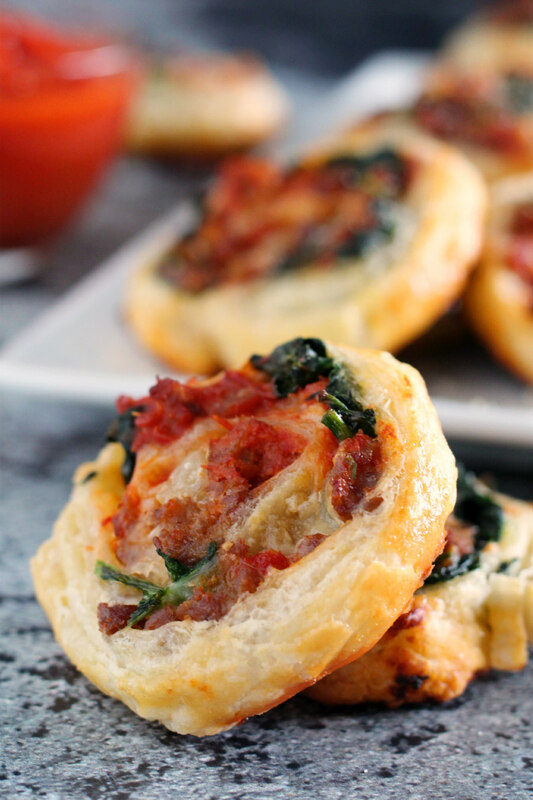 Spice up squash season with these Chorizo Stuffed Delicata Squash Rings! 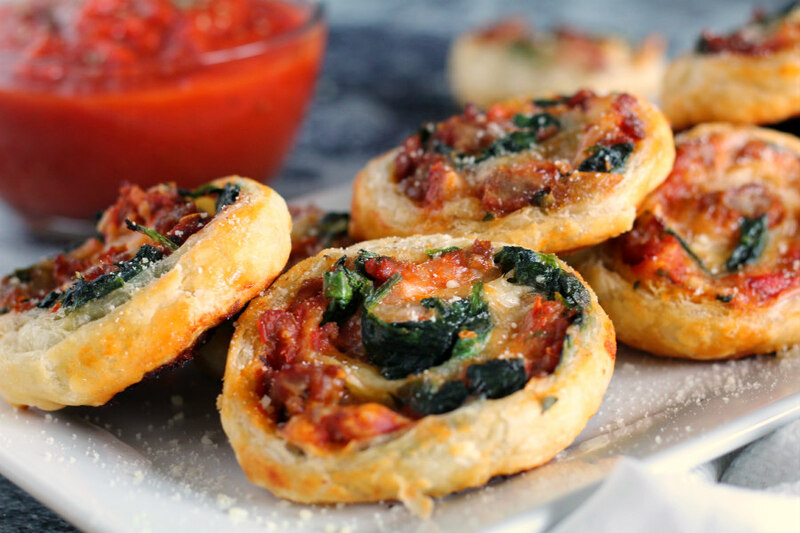 This dish is so easy to prepare and packs a lot of flavor in every delicious bite! Every once in a while, I get the urge to go to Trader Joe’s just to wander around the store and see what I can find (and, usually, I find a lot). That’s how I discovered delicata squash a couple years ago. I’ve found some pretty cool produce at TJ’s throughout the year that I probably wouldn’t have purchased otherwise. As a squash loving gal, fall produce is some of my favorite! I carefully read the tag displayed by the delicata squash bin and picked one up for under two dollars. That delicata squash started a whole new love affair with fall produce. If you’ve never had delicata squash before, it has a sweet, almost pumpkin-like flavor with a creamy texture. The skin is thin and edible, making it so easy to prepare! The first time I made delicata squash, I hollowed it out, cut it into crescent shapes, then roasted it with garlic, herbs, and lots of Parmesan cheese. It’s still one of my favorite ways to prepare it! I recently started to use ground chorizo in a lot of my cooking. Honestly, what took me so long? As spicy food lovers, I can’t believe our freezer isn’t stocked with it! It’s mild in heat and packs a lot of flavor! The slight heat from the chorizo and the sweetness from the delicata squash seemed like a perfect match for a fall dish. So I got to work on stuffing my delicata squash with ground chorizo and a few other simple, but flavorful ingredients. Just like other squashes, you can hollow out delicata squash and stuff it as a squash boat. But I always prefer to cut delicata squash into rings as a delicious fall side dish. 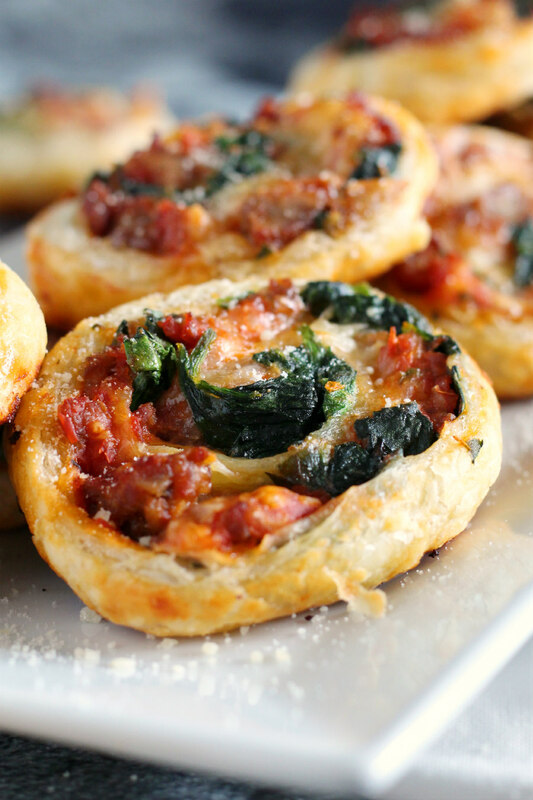 The fun part about this recipe is that it can either be a fall appetizer, side, or a meal. How you use it is totally up to you! I served it as a lunch with leftovers for the next day. You might even consider it a low-carb Taco Tuesday alternative and serve it with a splash of hot sauce! Preheat oven to 350 degrees and line a baking sheet with foil. While the oven is heating, brown the chorizo in a pan. Drain and add the onion and garlic. Continue to cook just until the onion and garlic have softened and become fragrant. Cut the hollowed out delicata squash into rings. Spoon the chorizo mixture into the center of each delicata squash ring and season with salt and pepper. Bake for 30-35 minutes, or until the squash has softened and the edges have started to brown. Sprinkle shredded Monterey Jack cheese and green onions on top and serve. In case you’re keeping track of your calendar, Thanksgiving is less than a month away! 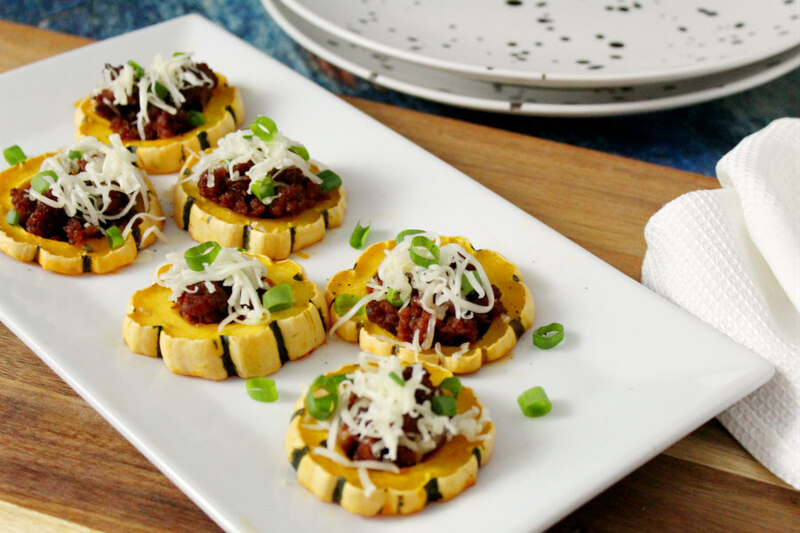 These squash rings would definitely add a little non-traditional flavor to your holiday menu! This dish is super easy to prepare and one delicata squash can provide a pretty decent appetizer for a small crowd (in my family, I’d double the dish). Keep this recipe handy the next time you’re looking to spice up your fall menu! It’s an easy dish to prepare that packs a lot of flavor in every bite! Plus, it’s a seriously cheap eat and who doesn’t love that? Have you tried delicata squash before?